Iran's armed forces have shot down an unmanned US spy plane that violated its eastern borders, military sources say. Iranian media reports said the drone - identified as a type RQ170 - suffered minimal damage and was now in the hands of the armed forces. The Nato-led Isaf force in neighbouring Afghanistan says the US drone could be one that was lost over western Afghanistan last week. Iran is locked in a dispute with the West over its nuclear programme. The US and its allies believe the programme is aimed at developing nuclear weapons. Iran denies the accusations, saying it is entirely peaceful. "The UAV [unmanned aerial vehicle] to which the Iranians are referring may be a US unarmed reconnaissance aircraft that had been flying a mission over western Afghanistan late last week. The operators of the UAV lost control of the aircraft and had been working to determine its status," Isaf said in a statement. A US official has said Washington had no indication the drone in question had actually been shot down, Reuters reports. Iran earlier said the country's military response to the airspace violation "will not be limited to Iran's borders any more", according to what one unnamed source told Iran's al-Alam TV. 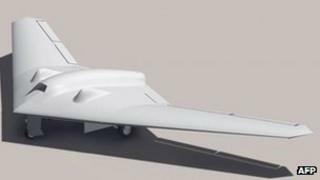 The RQ170 Sentinel is a stealthy and highly capable unmanned aircraft. It is shaped like a large flying wing similar to the profile of the manned B2 stealth bomber. Its shape and materials give it a low radar signature and it is clearly used for some of the most highly sensitive mission, says BBC defence and diplomatic correspondent Jonathan Marcus. First spotted at Kandahar air base in Afghanistan in 2007, an RQ170 Sentinel was used by the Americans to provide real-time intelligence over Osama Bin Laden's compound in Abbotabad, Pakistan, both before and during the raid by US special forces earlier this year. Iran said in July it had shot down a drone over the holy city of Qom, near its Fordu nuclear site. Last January, it said it downed two "Western spy drones" in the Gulf, but produced no evidence to support the report.